In Engage the Fox, authors Jen Lawrence and Larry Chester build on the four-stage thinking process they teach their students at the University of Toronto. The process can be used for simple decisions, such as whether you want to get a cup of coffee, or complicated decisions, such as setting a new organizational strategy. 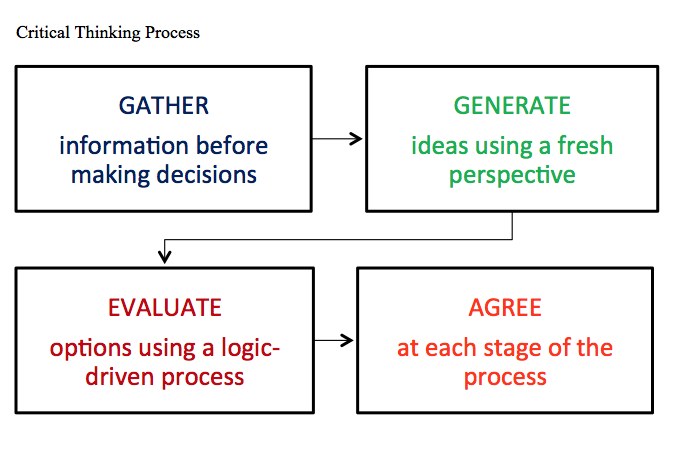 The process is: Gather –> Generate –> Evaluate –> Agree. Whenever you are faced with an issue, you first need to gather as much information as possible in order to determine exactly what is going on. 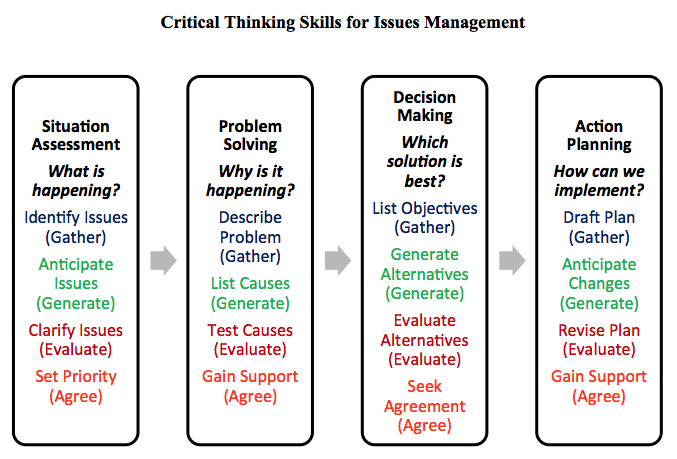 One of the key thinking pitfalls is jumping to conclusions and failing to get at the root cause, and a formal information-gathering process is helpful in avoiding this. In the case of a complex situation, it’s important to involve as many stakeholders as possible in gathering information. Not only will you get more diverse information on the table, but some people are natural gatherers who will leave no stone unturned. In the case of a simple issue, such as whether you want to get a cup of coffee, the information gathering process will be almost instant. You’ll quickly consider if you have time to get a cup of coffee, if you have had too much caffeine already, if you have room in your coffee budget for the week, and if it might spoil your appetite for lunch. With a more complex issue, this stage might involve in-depth research and fact-finding. Once all the information has been gathered, the next step is to generate ideas about potential solutions. In the case of a complicated issue, it’s helpful to have a number of stakeholders at the table as diversity generates more creative ideas. You might wish to do some benchmarking or other research to uncover possibilities. Even in the simple case of the cup of coffee, you could get a coffee, not get a coffee, or get a coffee later. You could also invite your boss for a coffee and use the time to tell her about your accomplishments, or you could save the money and calories and get a beer after work instead. The goal here is to get as many ideas on the table as possible and Intuitive types, represented by the titular Fox in the book, are natural idea generators. Finally, and most importantly, it’s essential that all of the key stakeholders agree with the decision. The more you involve everyone at the earlier stages, the easier this will be. The business world is littered with great solutions that have failed due to lack of buy-in so it’s important to engage Feeling types who focus more on how people will feel about the decision than the isolated merits of the decision itself. In the case of the cup of coffee, you might have ten great reasons to go and get a cup now, but if you are in the middle of a critical group meeting, you’ll have to consider the response of others if you were to leave mid-meeting. In the book, Dog, a natural pack animal, represents those who naturally consider the responses of others when making a decision. Engage the Fox walks the reader through this in-depth thinking process as Squirrel, Fox, Owl and Dog help Hedgehog, the publisher of the Toad Hollow Gazette, reformulate his newspaper’s business strategy in the face of online competition.